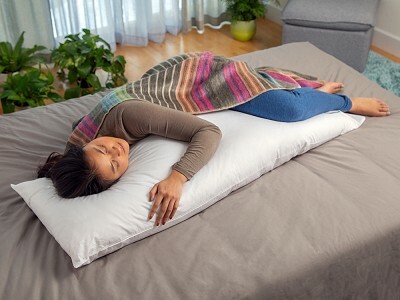 The snuggL pillow is a side-sleeper’s dream come true. 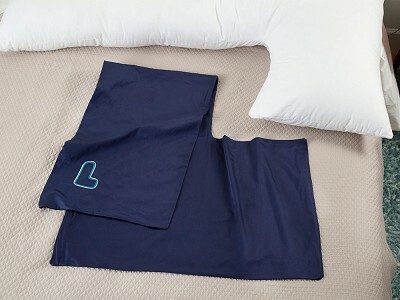 Its L-shaped design combines a standard pillow with a body pillow to promote better alignment and to ease back pain. It was back pain that lead Dr. Carl Cricco, Jr. to see his own doctor, who recommended sleeping with a pillow between his knees to help. The pillow never stayed in place, so Carl and his son (also named Carl) created their own solution. The L-shape design has medium firmness that supports your head and gives you more surface to wrap a leg around. Inside, hypoallergenic micro-gel fiber filling helps the pillow stay in shape and maintains consistent density throughout. It also lets the pillow adapt to your position and works to help keep you feeling cool. Though side sleepers are the obvious winners with a snuggL pillow, pregnant women and anyone with back pain can also benefit from its all-around cushiony comfort. Which size L-shaped pillow is right for me? 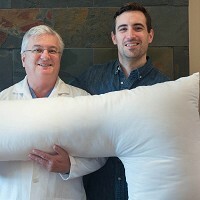 Anyone can use a snuggL pillow, though the XL is meant for those who are taller than 6 feet.